Truman Academic Social Norms Study: Habits and Strategies. Vera presented her poster entitled “Determining the Viabiliy of Calpain Inhibitors as Potential Drugs for Alzheimer’s Disease,” and Windsor presenter his poster “Investigation of Amyloid Beta Biflavanoid Inhibitors in Alzheimer’s Disease.” Windsor won an award for Best Undergraduate Poster Presentation in the COMP session, which came with an award certificate and $125 as a monetary compensation. Maria Nagan, former Truman chemistry faculty, presented the award. Windsor and Vera both applied for and participated in an undergraduate workshop in the COMP Division of the ACS, March 31. 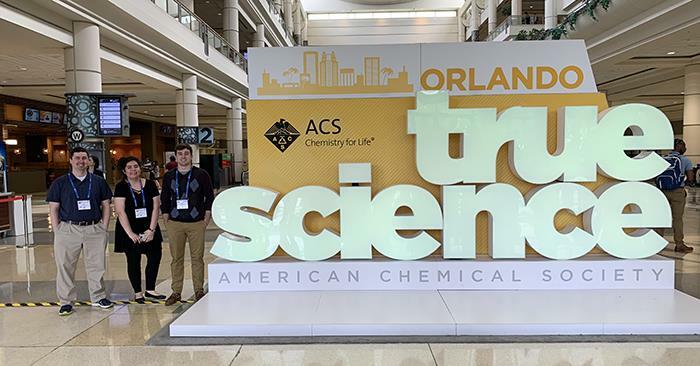 Bill Miller, assistant professor of chemistry and research adviser to Windsor and Vera, organized a symposium in honor of his post-doctorate advisor, Dr. Carol Parish, for winning the 2019 Award for Research at an Undergraduate Institution at the ACS meeting. Miller presided over one of the three sessions, honoring Parish and giving an oral presentation entitled “Modeling Excellence: Dr. Carol Parish’s Impact and Influence on Undergraduate Research,” where he emphasized Parish’s many accomplishments and impact as well as research being performed in the Miller lab currently.